Music is a universal language that speaks directly to our emotions. Champagne arouses our sense of smell and delights the palate. When music and champagne come together, each brings an opportunity to experience a new world of emotions. This is the experience that has now been made possible by Devialet, a French company that brings unrivalled sound purity, and Krug, the Champagne House founded by the visionary Joseph Krug, who understood the very essence of Champagne and revolutionized the industry. Since 1843, six generations of the Krug family have continued his vision and expanded on his expertise. Krug and Devialet will take you on a journey of the senses with their new box set filled with lost treasures. This unique box set created by Krug and Devialet is an invitation to travel through time, and to rediscover three Lost Editions of Krug Grande Cuvée and three Devialet Lost Recordings. 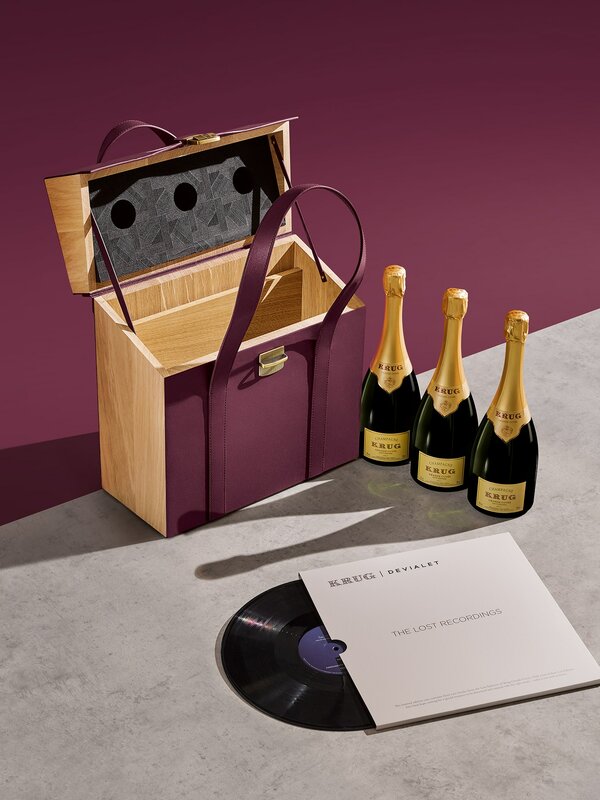 Nestled inside this box you will find Krug Grande Cuvée’s 156th, 157th, and 158th Editions beside an exceptional vinyl recording of a live performance by Ella Fitzgerald from 1961. A sensory experience in a highly limited edition: 15 box sets. Just once a year, a unique blend is produced and bottled exclusively: a new Edition of Krug Grande Cuvée, created like a musical composition. Only a few rare bottles have been carefully preserved in Krug’s cellars – until today. This rediscovery of Lost Editions of Krug Grande Cuvée draws a powerful parallel with Devialet’s The Lost Recordings adventure. It came about after the Fondamenta label set Devialet the challenge of finding a series of legendary lost recordings and restoring them using the very latest advances in technology. This box set brings six hidden treasures to life: Three Lost Editions of Krug Grande Cuvée and three previously unheard Lost Recordings – precious and incredibly moving. When the famous jazz singer Ella Fitzgerald performed "That Old Black Magic", "St. Louis Blues", and "You’re Driving Me Crazy" at the legendary Concertgebouw in Amsterdam, she was unaware that she was being recorded. Only now, 40 years later, can a wider audience hear the three tracks in the Lost Recordings project and experience the magic she created in her performances. You will find these three recordings in the Lost Editions box set, etched onto an exceptional vinyl record. The Three Lost Editions of Krug Grande Cuvée and Ella Fitzgerald’s incredible voice share the same wonderful depth, generosity, volume, and sophisticated harmony. Every year, the House of Krug pays tribute to the dream of its founder, Joseph Krug, with a new Edition of Krug Grande Cuvée, the most generous expression of Krug Champagne. Each new Edition is created from scratch and is entirely unique, making the vision of this exceptional man a reality. Krug Grande Cuvée’s 156th, 157th, and 158th Editions are composed of over 120 wines, and with more than 10 different vintages. The blend crafts a mosaic of aromas and flavors from this vast wealth, which is impossible to obtain from a single harvest. It is an orchestra playing together in perfect harmony. Once the Champagne has been bottled, it is taken down into Krug’s cellars where it will rest for about seven years. Krug only produces prestigious Champagne and has no hierarchy system. The most important characteristic of a prestigious Champagne is that it develops beautifully with time. Krug Grande Cuvée 156th Edition | "That Old Black Magic"
Krug Grande Cuvée 157th Edition | "St. Louis Blues"
Krug Grande Cuvée 158th Edition | "You’re Driving Me Crazy"